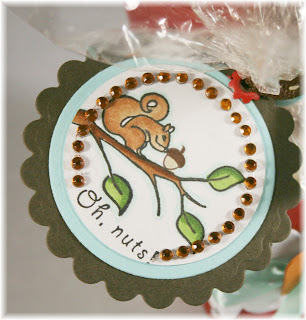 Stamp a Sweet Impression: Oh, Nuts!! Happy Monday everyone! 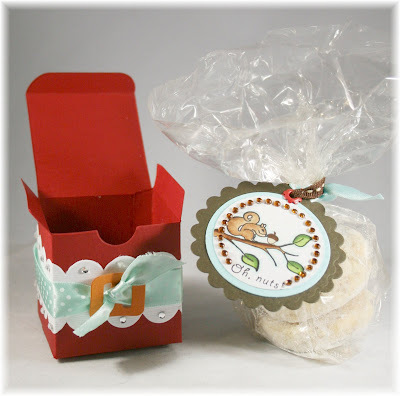 Today I have a cute little cookie box to share with you. I am in love with the new Whimsical Wishes set "Branching Out" and "Branching Out Coordinates". I knew I wanted to use them for this project. I recently went to La Madeline and bought these yummy almond/pecan nut cookies. They were so pretty and perfectly sprinkled with powder sugar that I wanted to make a cute container for them and give them away to a new neighbor that just moved next door. 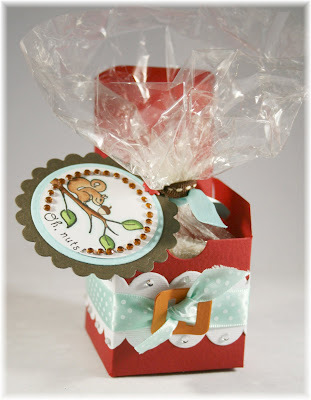 I started with the super adorable square favor boxes from Taylored Expressions. I embellished the box with some scalloped paper and ribbon. The buckle and the card stock from the tag are all from the Taylored Expressions new March Key Ingredients. To complete the project I added some Zva Creative crystals around the circle and scalloped paper. I really like how it turned out. I can't wait until tomorrow to give my new neighbor this little treat. Well, that's all for me today. This is just DARLING! Love all the bling!